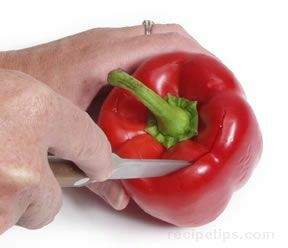 Core the pepper by cutting lengthwise on all four sides, cutting around the stem, seeds, and ribs. 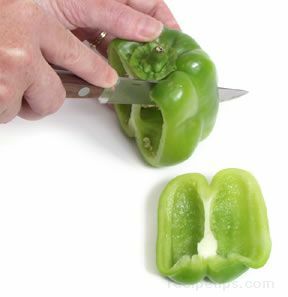 After trimming the sides from the core, use a utility knife to remove any remaining ribs from each of the sections of pepper. 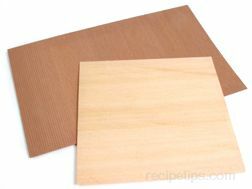 Trim the sections so that they are approximately the same size. 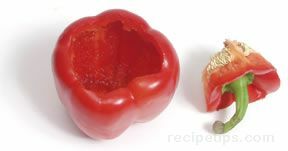 The pepper can also be cleaned by removing the core and scraping the inside. 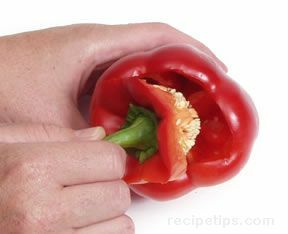 Begin by cutting a circle around the stem of the pepper. 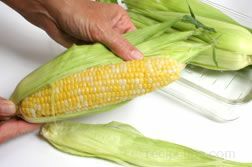 Carefully pull out the stem along with any seed and ribs that are attached. 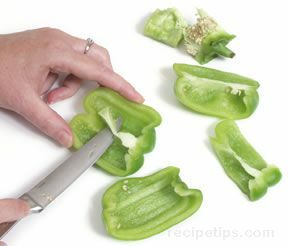 The pepper can then be cut lengthwise into quarters or smaller if desired. Preheat the grill on high. 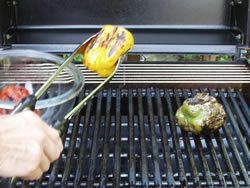 While grill is preheating, prepare the peppers by using one of the methods above. Once the stems, ribs and seeds are removed and the pepper is cut into sections, place them on a baking sheet. Brush them with oil on both sides. 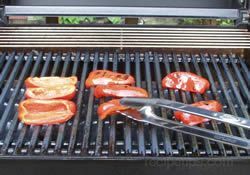 Place the peppers on the grill directly over medium heat. Cook for 6 to 10 minutes, turning once throughout cooking time. 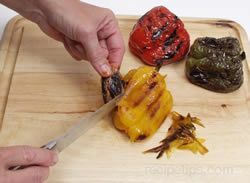 Remove peppers from the grill when they are tender-crisp and nicely browned. Eat as desired. 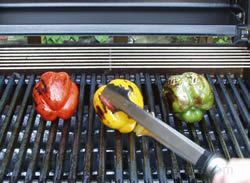 Peppers can be roasted on the grill to be used in other recipes. 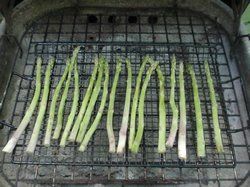 You can grill them ahead of time and store them for later use. 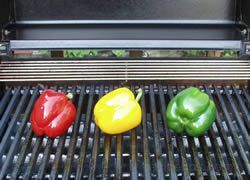 Preheat the grill on high and then turn to medium-high to roast the peppers. 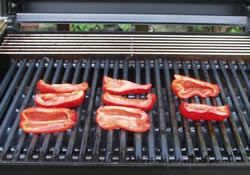 Place the whole peppers on the grill directly over the heat. 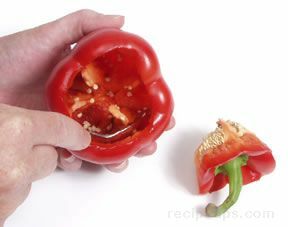 Turn peppers often through cooking time. Cook for 10 to 12 minutes, until peppers are well charred. 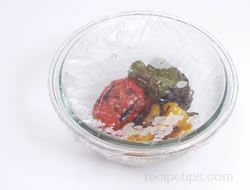 When done, place in a bowl and cover tightly with plastic wrap or place in a plastic bag and seal it. 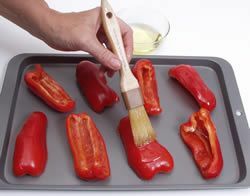 Allow roasted peppers to stand for 15 to 20 minutes. The steam will loosen the skin from the peppers. 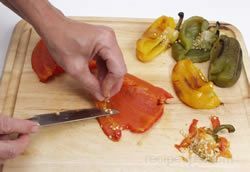 Remove the peppers from the bowl or bag and peel the skins from the peppers. 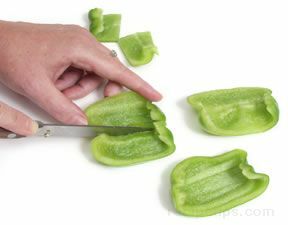 Cut in half lengthwise and remove the stems, ribs and seeds from the peppers. The peppers are ready to be eaten or they can be stored in the refrigerator for up to 2 days. 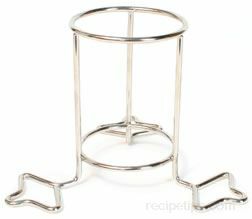 To freeze, placed in an air-tight freezer bag and place in the freezer where they they can be stored for several months. For more information on peppers, see All About Peppers.